Can you accomplish near-total motorcycle security for around $200? Well, that’s how much my setup costs and, at home or on the go, it locks my bikes to an immovable object, immobilizes a wheel and sounds a piercing alarm if the bike or locks are messed with. Read all about it in this Xena XX15 Disc Lock Alarm and Chain Adaptor review. The full setup pictured here includes a Kryptonite New York Fahgettaboudit Chain ($100 on Amazon ), plus the Xena XX15 disk lock alarm and chain adaptor combo ($100 on Amazon ). We’re going to focus on the Xena products in this review. The XX15 is the biggest, strongest disc lock alarm in Xena’s range. The lock body is a very large, single piece of stainless steel with a large cutout that will fit around any brake disc, leaving plenty of room for the 14mm carbide steel locking pin to pass through. Inside that stainless body is a motion detector powered by an included CR2 Lithium battery. If the bike or lock are jostled in any way, it gives you a few seconds of warning beeps before sounding a 120dB alarm. It’s as loud and as sensitive as any of the more-expensive alarms that install inside a motorcycle and is probably harder to defeat. There’s no way to unlock, open or even touch the XX15 without sounding the alarm and penetrating its stainless body will be exceptionally difficult. You access the alarm module and battery by using a special tool (included) to slide a lever inside the base plate that will be totally inaccessible if the lock is clamped around a brake disc. Addressing customer complaints that its previous disc lock alarms were too sensitive to certain environmental occurrences like wind and passing trucks, Xena has redesigned its alarm sensor to remove those variables without reducing its sensitivity to tampering. The stainless steel chain adaptor neatly slots into the disc lock without reducing the depth of its aperture. It can accept any security chains up to 14 mm in diameter and the shackles of those chains protects most of the adaptor’s length, eliminating any potential vulnerabilities. Eliminates the need to modify a bike’s wiring harness in order to install an alarm. Won’t drain your bike’s battery. Excellent battery life; a single CR2 in my previous Xena lock lasted over a year of daily use. Adds two layers of security in a single, convenient product. Can’t lock without using the key, meaning there’s no chance of accidentally stranding yourself. Hugely strong and immensely reassuring security. Anti-tamper, anti-drill, anti-pick, anti-freeze lock. Shockingly loud alarm can be heard blocks away, from inside your house or even outside your garage. Being near while it sounds is an extremely unpleasant experience. Thieves will be forced to crop your chain or remove your anchor long before they’ll be able to defeat the XX15, with it sounding that 120dB alarm all the while. Attaching a disc lock is much quicker and easier than looping a chain through the wheel and doesn’t cover your hands in road muck and brake dust. The disc lock/chain adaptor combo effectively increases the useable length of your chain as it no longer has to wrap through wheel and tire. Anyone who’s ever tried to pass a chain around a thick lamppost or been forced to lock up in otherwise awkward circumstances will appreciate the extra four to six inches that nets you. The warning beeps double as a reminder if you hop on the bike after forgetting to remove the disc lock. No need for a lanyard or other reminder. Great for road trips. Park your bike outside your tent or motel room safe in the knowledge that, if anyone touches it, you’ll be alerted. The XX15 is large and heavy, making it difficult to squeeze under the seats of modern bikes. If you don’t need the chain adaptor, the smaller, cheaper XX6 is just as effective. For purposes of maximum security, the alarm will sound throughout the battery swap process. We admire the no-loopholes approach, but man does it hurt your ears. Using the disc lock as the means to lock the chain to your bike means you’re not securing both wheels. Inserting the key can be a fiddly process, especially in tight quarters. I set off the alarm as a result for a few seconds once a week or so. Extraordinarily effective security in one affordable, convenient package. Paired with a quality chain and used with a paranoid mindset, the Xena XX15 and Chain Adaptor combo will be the most effective tool in your anti-theft arsenal. A must buy for any urban rider. The post Xena XX15 Disc Lock Alarm and Chain Adaptor Review appeared first on RideApart. Crashing a bike is expensive business. So expensive, in fact, that you could probably “total” most new sportbikes simply by tipping them over in the garage. But, for a few bucks, you can easily add protection parts that should keep it safe even in the event of a fairly significant crash. Here’s how. Now, all motorcycles are a little different. While a big ADV bike is going to benefit from huge engine bars and aluminum panniers, those parts wouldn’t fit on a Panigale and, even if they did, they’d look pretty stupid. Let’s go through some of the most common add-on protection parts for road-going motorcycles and examine how they safeguard your bike. The most common protection part for street bikes, frame sliders attach to a motorcycle’s frame, engine block or both with sturdy bolts. Typically made from nylon, the sliders do what the name suggests — they protrude enough that they’re the first part to touch down in a fall, then they’re designed to slide freely along the road surface. 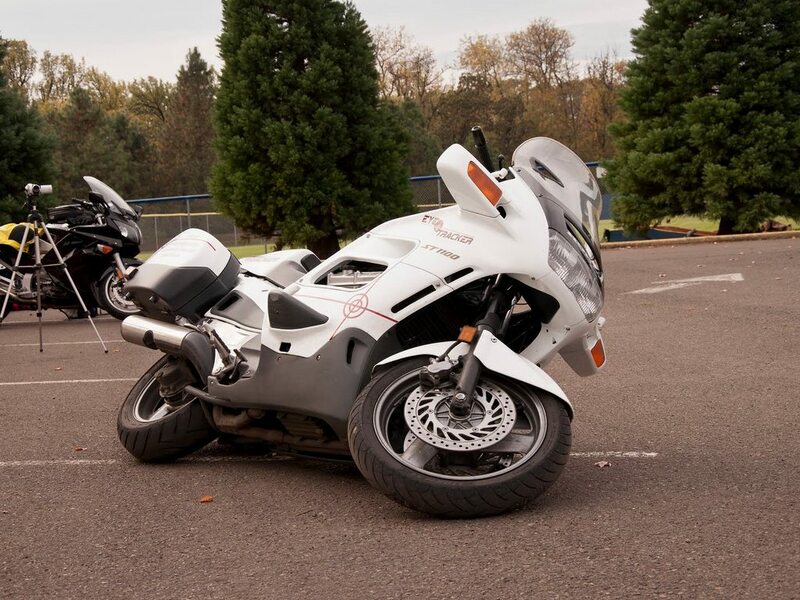 Bikes experience more extreme damage when they grip the road and flip over. Your protection plan should start here if you ride a sportbike, naked, sport tourer, tourer or similar road bike. Like “Kleenex” is used to describe all brands of facial tissue, “Barkbusters” is a specific brand of lever/hand protection products that ends up denoting all such items. Basically, a sturdy aluminum bar bolts to a new bar end weight on the outside, then clamps to the bar on the inside. This may be supplemented by a plastic plate designed to expand the area of coverage (these are killer wind deflectors for winter riding). The idea is to keep your levers from being broken in a crash. Broken levers equal an unrideable bike, so that’s a good idea. Because they is some give in the bar where it clamps onto the handlebars on the inside, it can absorb energy in a crash, possibly saving your bars from being bent or broken too. These typically fit any motorcycle with flat handlebars, but check the specs of the product against your bike to make sure. As good an idea on the road as they are off. Aftermarket rearsets allow you to alter the position of your motorcycle’s footpegs. Any stock motorcycle should only be considered an ergonomic starting point, so these help there, but many rearsets also come with strong pegs that don’t fold up. Those work as auxiliary frame sliders, helping to keep the swingarm and bellypan off the ground. These pass through the front axle, providing sliders for the front forks and brakes. The added protection isn’t as significant as frame sliders or rearsets or Bark Busters, so start with those first and add these after. Same goes for these, but they double as mounting points for a paddock stand, making it easy to lift your rear wheel to change it or adjust the chain. Added protection is fairly minimal compared to other items on this list. Aftermarket generator/clutch/crank covers made from billet aluminum or even composite nylon are tougher than stock cast aluminum items, resisting wear. You won’t put a hole through one of these but they’ll do little to protect the rest of your bike. Not only do these cost less than stock fairings, but they’re often made of tougher materials too. Avoid trashing your expensive stock equipment while providing all-over protection for your bike with these. Natty little press-on carbon fiber or similar tank covers provide some limited abrasion protection for the exposed sides of your fuel tank, but are more gimmick than function. Invest in a good pair of large, sturdy frame sliders instead. These large, sturdy protection bars fit ADV and dirt bikes and provide massive amounts of protection in a topple. But, because they’re designed mostly for dirt crashes, they may grab pavement and topple your bike, actually exacerbating damage. A necessity while riding big, heavy ADV bikes off-road. These cover a motorcycle’s exposed oil filter, downpipes and sump, protecting both against rocks thrown by the front wheel and impacts with obstacles. A very, very, very good idea while riding off-road; a holed sump is no fun. It’s not built to do so, but you’d be amazed how effective both hard and soft luggage can be at protecting a motorcycle in a crash. Particularly the hard plastic and metal panniers that have been popularized by the ADV scene. Because they protrude so far, they provide excellent protection from drops, often keeping the entire motorcycle off the ground. Just be cognizant of how said luggage mounts to your bike, ideally you’ll have failure or stress relief points (ie joints or connections) between the luggage and the subframe, giving energy a place to go other than into your motorcycle. In addition to making it clear to each and every person around you just how much you have to compensate for, aftermarket exhausts are often cheaper than their stock counterparts. Because of that, replacing one after a crash costs less money. Please don’t use this to justify running a 120dB system on the street. Those are some things that can help your bike stay intact during a crash or a topple. What aftermarket parts do you swear by? According to a recent poll from the AA, 85% of drivers say that motorcyclists are 'hard to see'. The stats were presented by the current president of the AA, Edmund King, whilst addressing a motorcycling conference on 'Sharing The Roads' in London this week. Worringly the poll also found that 57% of all car drivers are 'often surprised' by a motorcycle appearing from nowhere. However, Mr King believes that a clearer and more pronounced approach from those in charge of transport policy could greatly increase motorcycle awareness. “We have heard much lately about improving the safety of cyclists from the Prime Minister downwards yet motorcyclists appear to be the forgotten cousins. Yet motorbikes and scooters can play a vital role in helping to reduce congestion and enhance mobility in our towns and cities." In the same AA poll, it was found that an increase of motorcycles on the roads would greatly aid in the overall visibility of bikes and motorcyclists, with 54% of people surveyed saying that they would be more aware of motorcycles if there where more bikes on the road. Encouragingly, 13% would also consider using a motorcycle themselves for their daily commute.